COLUMBUS, Miss. -- Four Mississippi University for Women students and their adviser recently attended the Phi Beta Lambda National Fall Leadership Conference in New Orleans held Nov. 17-19. 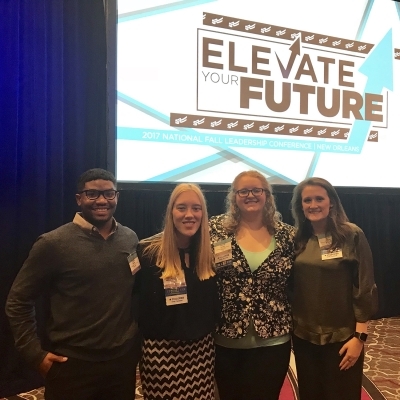 Students attending the conference included senior health care management major and PBL chapter President Lauren Axthelm, sophomore accounting major Sarah Holley, senior management major and PBL Treasurer Hannah Horton and junior health care management major Cartez Posey. Thomas Haffey, who serves as The W’s PBL chapter adviser and instructor of marketing, accompanied the students. The group also experienced the sights and food of New Orleans, including a tour of float making company Kern Studios at Mardi Gras World. “We also ate a lot of good food in New Orleans and enjoyed our trip to Cafe Du Monde and Mardi Gras World. Mr. Haffey and everyone in the College of Business who helped make the trip possible deserve a huge thanks," Axthelm added. MUW is slated to host the PBL State Leadership Conference Feb. 21-23, 2018. Approximately 150 students and advisers from all over the state will be in attendance competing in a variety of events while enjoying The W’s campus. Future Business Leaders of America-Phi Beta Lambda, Inc., the premier student business organization, is a nonprofit 501(c)(3) education association with a quarter million members and advisers in more than 6,500 active middle school, high school and college chapters worldwide. Its mission is to bring business and education together in a positive working relationship through innovative leadership and career development programs. The association is headquartered in Reston, Va., just outside of Washington, D.C. For more information, visit fbla-pbl.org.